The God Bless Deli Grocery now has felafel and shwarma! I had the felafel Friday night. It was in a lafa and not a pita bread, but it was delicious. I would have had the schwarma today but they were down to almost nothing. They’ve got a menu now and are really picking up their game. They’re good guys and they are open 24/7. 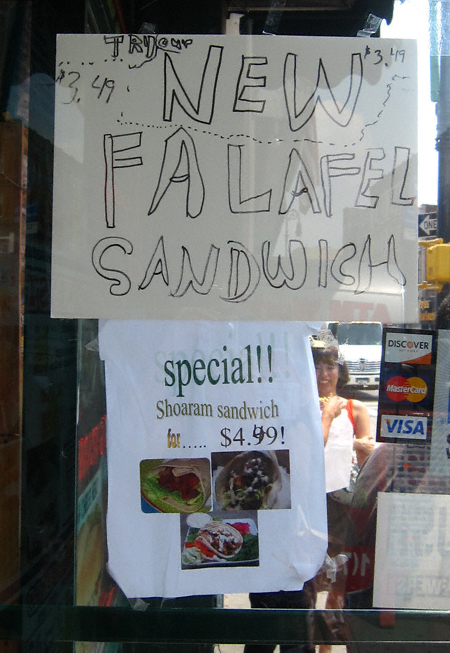 When I walked by today, sure enough, falafel was advertised on the God Bless Deli’s front door. For the very affordable price of $3.49, no less. 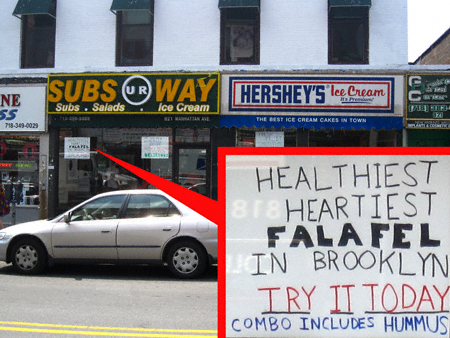 And— not be outdone— Greenpoint’s newest sandwich shop, “SUBS UR WAY” (which is located just across the street), has also entered the falafel fray. As for which one offers better fare, that remains to be determined. 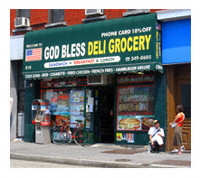 I have heard mixed reviews about God Bless Deli. And as for SUBS UR WAY, well, I learned last weekend a simple (and pretty small) scoop of chocolate mint ice cream in a sugar cone will set you back $2.70. OUCH. For those of you who are keeping track, this brings the number of establishments in Greenpoint that now serve or in the near future will serve these bits of chickpea-filled goodness to— not three, not four, not five— BUT SIX. 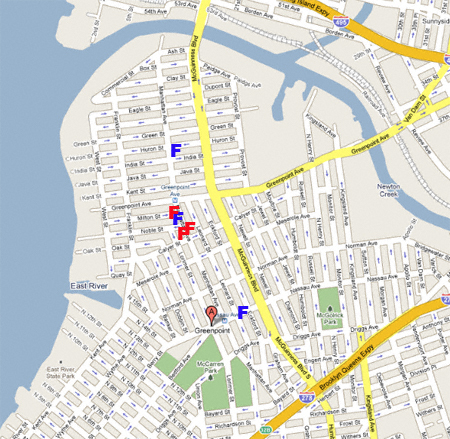 The red “F”s indicate where falafel is currently being served, the blue “F”s indicate establishments where falafel will eventually be offered. I have heard all good things about God Bless Deli (and I love their neon!). I can tell you, before giving up fake food, I’ve dipped in there many times for candy and chocolate. They have a good selection (and are very nice). I know Diana was thrilled to hear about their falafel offerings.